Painting in the late Gothic style, Hans Maler often signed his name Hans Maler zu Schwaz, from his home of Schwaz in the city of Tyrol, Austria. This was near the capital city of Innsbruck, where the Habsburg Court reined, under Ferdinand I (1503 – 1564), Archduke and later Holy Roman Emperor. Ferdinand I was a major patron of Maler, as was the wealthy merchant family, the Fuggers. Born in the city of Ulm, just off the Danube River, Maler is noted to have possibly received training in the School of Ulm under the German painter, Bartholomäus Zeitblom (1450 – 1519). His first known portrait work is a 1510 portrait of Mary of Burgundy (1457 – 1482), wife of The Emperor Maximilian I (1459 – 1519). Though, he is also known to have painted portraits of the Emperor additional to a noted fresco piece in 1508 for the Ambras Castle in Innsbruck depicting the House of Habsburg family tree. His portraits, under royal and wealthy patronage, were respectable and dignified representations. One could not get a sense of personality from his representation of ruling class subjects; reinforcing their important and status. The style of his composition never strayed from the formal bust sized pose of the sitter, gazing off to the left or right. In his 1524 portrait Ferdinand of Castille, now in the Uffizi Gallery, his subject is at an almost complete side profile; a departure from his usual slight right or left turned gaze. His skin tones were usually slightly rosy in complex, set against his subjects’ decorative costume, often with a bluish background. He found a gainful patronage under the Fugger family, painting portraits of Anton Fugger and Ulrich Fugger, sons of Jakob Fugger (1459 – 1525). 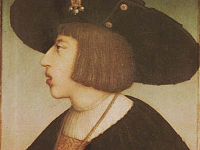 The Fuggers and the Habsburg Court were connected in many ways, the Fuggers often funding the procurement of royal elections, Jakob himself later became nobility within the Holy Roman Empire. Maler also painted portraits in 1517 of Sebastian Andorfer, a successful metals dealer from Schwaz. Maler died in Schwaz in either 1526, or 1529.